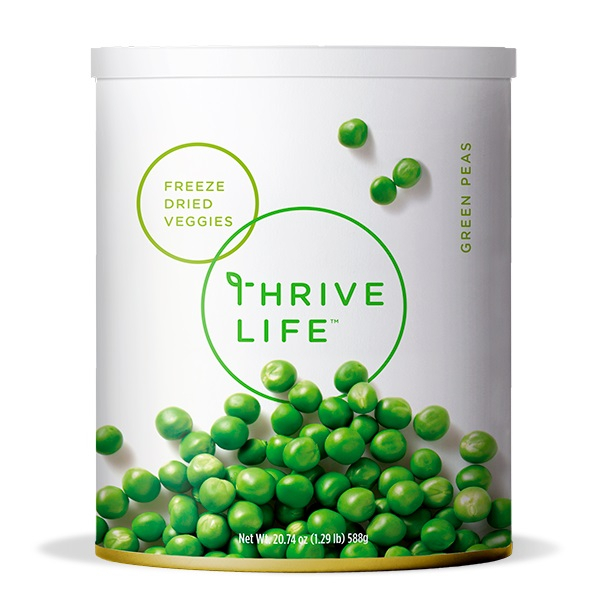 Thrive Green Peas are the perfect simple snack or ingredient. Whether you eat your Thrive Green Peas straight from the can or as a side dish, you will love their simple garden-fresh flavor. The nutrients found in each serving of Thrive Green Peas support strong bones, as well as cardiovascular and prenatal health. As with all Thrive freeze-dried products, Thrive Green Peas are guaranteed to taste fresh and delicious for years to come. Just add a little water and Thrive Green Peas will liven up your salad, casserole, or soup. Add 1/3 cup of water to 1 cup Green Peas; let sit covered for 2-3 minutes or until tender. Use in fried rice, soups, and side dishes. They're not hard like dried peas, so they're easy to snack on in their dry form.